Gen. Zia took me along to the Presidential Suite and started the closed door meeting. It was not difficult to understand that to night he is going to discuss about some confidential and important matters. Tea was served like last night. He made the tea in two cups and offered me one and took the other himself and sat face to face. I was proud the way Comrade Teng Xiao Ping praised you for your sincere efforts to promote bilateral relation. You have done as I expected. The way Chinese looks at Bangladesh and their principled interest had contributed more than my efforts. I tried very humbly with sincrerity to make them understand how much it is important to develop far fetched Cino-Bangladesh bilateral relation on a solid foundation for the sake of stability in this region to the best of my capacity. One more thing I emphesized, being under the ominous watch of expansionist India, it is imperative for Bangladesh to develop muti dimentional friendly bilateral relation with PRC to serve the mutual interest of both the countries. Listen Dalim, I shall not deny the fact that when you visited me at Kolyani incognito and explained the necessity to raise an sectrte organization under the cover of the liberation war on the basis of which to organize Sena Parishad after indepencence and details about it’s ideals, primciples and the political manifesto to fight back the far fetched blue print of the Chanakyas, I had taken the oath touching the Holy Quran to work together after due deliberation and being fully convinced. But after 7th November a situation had developed where I had to take some tough decisions to bring the situation under control. But even now I am trying to do politics on the basis of your ideals and principles. The 19 point programe that I have announced is the proof of that. The 19 point programe is nothing but reflection of the political manifesto of the Sena Parisad. I agree that in the process of implementation I had deviated and chosen a different path. But now I am realizing that some of my decisions and actions have become questionable within the armed forces. Armed forces is the batchion of my power and if I become controvertial and weak within my power base then how can I move ahead in the national politics? I also feel that you all are also gradually taking yourseleves away from me with out speaking it out, why? Sir, your alligetion is not justified. We are not taking away ourselves rather with meticulous planning we had been dragged away. When I contacted you at Kolkata I realized your knowledge about people’s war and politics was limited. That is why obliquely I had been trying to impat some basic knowledge on those two subjects in our sittings. Now you are the head of state and also doing politics. Even then I feel you still lack in astute political acumen of doing people’s politics. Therefore, I would like to say a few words if you like. The very word ‘Politics’ is interpreted in two ways both philosophically and ideologically in political science. One is ‘King’s ideals and principles’ which is known as power politics. The other one is ‘King of all ideals and principles’ which means politics for the vast majority of oppressed and down trodden people. When you were doing the intelligence course in Pakistan, there was a thin book titled ‘The Prince’ written by Machiavelli in your syllabus. This book is regarded as the Bible of power politics. I am sure you must have studied that. Therefore, I feel it is not necessary to talk about power politics. But I feel your knowledge about the politics for the vast majority of the oppressed and down trodden people is not adequate. So, I shall like to dwell on that if you permit. Infact, I wanted to change the topic to distract his thought process. Grim faced Gen. Zia knowingly or unknowingly gave his consent. You must know, for the success of the politics for the vast majority three weapons are absolutely necessary. A party based on a clear ideogoly and manifesto reflecting morality, values and aspiration of the vast majority. Tested selfless fully commited leadership. A fleet of motivated and trained cadres particularly, the youths recruted from all segments of the society who shall merge with the people propagating the party manifesto rationally with convincing logic and mobilizing the mass in favor of the revolutionary programes of the party. These three absolute requirements can only be acheived through movements. Sitting at the centre of power it is not possible to aquire these. Because, all those moves around the person at the helm centre of power do so only to secure berth at the corridor of power. On the face they would get engaged in a rat race foamenting vehemently to express their suppport to the ideals, principles and programe of the strongman but most of them would turn out to be self seeking oppurtunists, replica of cunning foxes and hyenas. After saddling around the centre of power they would very easily change the dream of the strongman’s pro-people politics into power politics. In the heinous conospiracy hatched by these blood suckers many sincere leaders with pious intentions had to suffer fateful consequences historically. More over, no matter how strong any leader might be, it had never been possible to attain his cherished goal pleasing every one. With out discriminating between friends and foes if one proceed to cohabit the the end result would be the same when some one gets into water to fight a crocodile. We are not supposed to know what is your present position in the armed forces. You would be knowing the best in this regard. On the political front the party you floated with all stray elements of diversed mind set, motives and interests there the inner conflict of interest would be a permanent phenomenon. It is a crude reality. In this back drop I must say your party rather a fissionable platform based on your ideals and programe whatever that might be would never be able to take roots deeply within the people. Of course, your stallwarts would be on the race fattening themselves as long as your popularity prevails. Regrettably, I must say Sir, even after seeing the pathetic end of Field Marshall Ayub Khan’s power politics which finally broke the most prospective Muslim country into two halves, how could you decide to charter the same course! You have the knowledge to understand what could be the ultimate cosequence of shuch self deafitting politics so, no further elaboration is required. I am not aware who all are your advisors or from where you had been advised to persue this kind of disastrous politics but I know one thing for certain that it is you alone who has to bear all the consequences. The history never forgive anyone. Gen. Zia was looking grave that was clearly reflected in his face and body language. 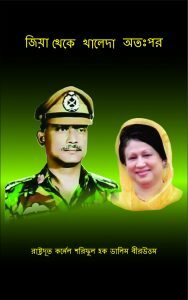 Okay, what do you think about Gen. Ershad? I find this surprisibg! You both are contemporaries in East Bengal Regiments. Serving for long together. He is your chosen Chief of Army Staff, so, it is you who should be knowing him better. I did not get any opportunity to know him as such while we were in West Pakistan. While escaping to join the liberation war, I came to know that he was then commanding 6East Bengal at Peshawar. After repatriation I met him couple of times when I used to come to Dhaka and visited Sena Shadar. About his personal character you know if not more but no less than what I know. Sir, you have served in the intelligence agency the ISI. But I had never served in any intelligence agencies. After becoming the President, while Gen. Ershad was doing his NDC in India, you had promoted him out of the way and latter appointed him as the Chief of Army Staff. It wouldn’t be unreasonable to think that you had taken that decision after due deliberation. However, some ubauthentic information about him floating in the air has reached up to me. If you are interested I can reveal that to you if you are interested. Possibly, you might be aware of those information already. I would like to know so, say what are those. His inquisitiveness reminded me of what his course mate Col. Hamid had written about Gen. Zia’s in his book. About the character of Gen, Zia he wrote, “ Zia has a suspicious mind and beleaver in hearsay”. Rumor goes, when Gen. Ershad was doing NDC in India at that time one astute diplomat Mr. Muchkund Dube befriended him. He was also then doing the NDC course. Naughty ones say that he introduced Gen. Ershad with a few very poweful personalities in the South Block and RAW after knowing that he was on his way to be appointed as the Chief of Army Staff on his return. By the kind curtesy of those people he had a enjoyable good time and on his return after finishing the course you appointed him as the Chief of Army Staff. Gen. Zia was listning attentively and thinking something. He was persuing ‘Devide and Rule’ policy within the army that might have become achill’s hill for him now! That is what he might have been thinking for which his dark face was showing even darker. Okay, now tell me what is your impression about Gen, Manjur? Sir, knowing much more than what I know about him why are you interested to know my impression? Whatever you know about him how it is possible for me to know more than that? But Sir, the ‘Devide and Rule’ policy that you have introduced in the armed forces to strike a balance between the freedom fighters and repatriates has given birth of a serious conflict and presumably that is getting intensified day by day that much I can say. What could be the ultimate consequence of such a conflict that should not be too difficult for you to understand. I shall tell you a reality not knowing if that would be of any use to you. The freedom fighters are the majority in the armed forces therefore, to make them humiliated and weaker is not reasonable that is what I think. Your decision to promote Gen. Ershad and appointing him as the Chief hasn’t been accepted as a correct decision by most of the officers and soldiers I suppose. In this regard you have to ponder to find out the facts yourself as I am not aware of anything more to say in this regard. Gen. Zia remained quite for a while then again requested that I should discuss his proposal with other coulleagues and go to Dhaka. There after evaluating everything on ground I must meet him to convey our final decision. This is how during his 48 hours visit he talked to me for more than 8 hours in closed door sessions in two nights. Although I was not clear as to why he held the meetings but one thing was very clear that ominus clouds agaibst him were gathering in the horizon of Bangladesh. After calling it a night I returned to my residence. Next day he along with his entourage flew off to Piyong Yong. This was also a state visit. After meeting the great leader Kim Il Sung a few bilateral MUO were signed.